Libra are inclined to plow through life, not getting involved in intricate deeds, - according to them, people should be nice to each other in any situation. And so, despite the fact that Libra is considered a sign of justice and the law, when it comes to bringing charges, they hesitate, Libra parents never stay in the same mood for long, and this can be dangerous because Taurus aspires to Confidence. He wants to know if his parents will agree tomorrow, the day after tomorrow and a year later with what they said today. Because the little Taurus is amazed when his parents, Libra, who categorically forbade him anything yesterday, tomorrow soften and give permission. Weights need manifestations of softness. For them, the idea of ​​injustice is unbearable, and of course, they try to consider the problem from all sides and judge sensibly. But the trouble is that most of all Taurus appreciates constancy. He would prefer that the parents insist on their own, and not try to curry favor with him. Possessing an unmatched charm, Libra knows exactly what to say in order to calm others and avoid storms. Even the inflexible Taurus can be completely disarmed by Libra’s judiciousness. Thanks to the brilliant communication skills, Libra will not cause Taurus’s dissatisfaction, agreeing to some concessions - so that in the transaction, Taurus only wins, and the world re-enters the world. This friendly pair is helped by Venus herself, and they are happy with each other’s company. Mom is full of charm, she has a good relationship with everyone, and everything beautiful gives her pleasure. She is pleased with the location of her Taurus child to people who are important to her, and she likes his steadfastness and devotion. Both of them are able to appreciate the beauty of things and human relations, while cherishing the necessary acquaintances. Of course, Taurus does not doubt that he has a wonderful mother, and does not hesitate to show tenderness, continually caressing her. And this gives Libra a feeling of the warmest love on the part of the child. Libra mom is also able to show her love, and this is just the way, because for Taurus physical contact is important, that is, a constant and very concrete manifestation of warmth. If this for some reason is not enough, the child can become withdrawn or disobedient, as if showing that he is somehow deprived. Careful Libra will see to it that the little Taurus grows in an atmosphere of harmony and peace of mind. A Taurus will help the mother to maintain poise, because his purely earthly approach to life helps Libra to stand firm and do not constantly weigh everything for and against. Taurus does not share Libra’s indecision and does not waste time on all these "buts" and "maybe." He looks at life much easier, meets every new day without unnecessary doubt and does not shake over any decision that must be accepted. Mom-Libra loves to discuss everything, and she likes to prove that she is right. But a consistent Taurus should not be tired of arguing for the sake of argument - he prefers a quiet life in which everything is stable and unchanging. Logical arguments of the mother about why he should or should not do anything, he finds it too tedious and suspects that the mother thinks too much about everything. This mother is more sociable than her little Taurus, and she tries to take him with him to different parties and meetings, trying to instill in him a sense of confidence in society. Taurus is not as talkative as his mother - in fact, here he can have a somewhat slow development, so that he is markedly different from Libra with their love for chatter. Mother-Libra should be more careful when she says something to Taurus: he is very hurt by rash remarks, although he will go on gloomy for a long time, hiding it. When it comes to choosing a profession. Libra usually give reasonable advice, wanting for their child only the best. And Taurus really is useful in life. It is the mother of Libra who can bring him to art, give freedom of choice, teach friendship and the ability to find a worthy place in society. Full of optimism, Libra dad with joy will help his not so positive-minded child to get rid of bad mood - so that there is no hint! Libra believes that life exists to enjoy it. So you need to get friends and organize parties. But Taurus is too attached to the house, loves that the father and mother are there and prefers to the noisy company the presence of several close and reliable friends. So he will have to adapt to the style of his father’s life. Libra is well aware of the mood of children, and his father, perhaps, will not protest Taurus’s desire to be himself. Papa-Libra is ready to spend a lot of time talking with the child, listening to him, developing his speech skills (here even some help may be needed, especially at an early age). Libra will try to teach the little Taurus not to be too attached to other people and be able to show them their strengths - reliability and willingness to help in difficult times. The father will be able to awaken the imagination of a terrestrial Taurus, too, with brilliant stories and precise observations. He will show his child what it means to enjoy life. Libra father is a wonderful teacher, and it’s wonderful if he takes upon himself parental concerns. Libra understands that Taurus certainly needs training, because this small practical being perceives life a little slow and not as bright as the father himself. 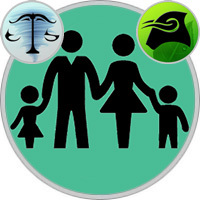 Libra treat their children as well as adults, always respecting their partner. And Taurus does not hurry to grow up. Independence is, of course, good, but he would not want to be pushed into it by force. This father will not overly drive his child, allowing him to develop in a leisurely, but steady pace. In the end, Taurus will overcome everything, and a sense of security and reliability will allow him not to be afraid of life in a big and not always understandable world. Patient father-Libra tries to smooth out sharp corners. He will not constantly rebuke his Taurus for his stubbornness. However, at times he becomes too logical and does not consider that the child needs quiet rest periods, in which he so needs. The father does not show his own problems, but from time to time he breaks down, especially if tension accumulates inside him. Taurus would like to see him calm and composed - such as himself. But he is ready to forgive him a lot. He well understands that it was the father who opened his eyes to what life is. He rejoices at his support and understanding, and he is well in their prosperous home, which was created for him by the cares of his father.